The window represents the biblical account of Jesus raising his hands to bless the disciples and then ascending to heaven. This took place at Bethany several weeks after his Resurrection. Jesus’ hand gesture with his first two fingers and thumb pointing and last two fingers closed is a sign of blessing and the three open digits have also come to represent the Trinity. If you look at Jesus’ left foot you can see that the wound from where he was nailed to the cross and his identity is also confirmed by his cruciform halo. Either side of the centre light are the two angels mentioned in the Bible who appear to the disciples and tell them that Jesus would return to them in the same way they had seen him leave. At the very top of the window is a quatrefoil light containing a crown surrounded by fleur-de-lys to show that Jesus was ascending to his position at the right hand side of God in the Kingdom of Heaven as part of the Trinity. The halos surrounding those at Jesus’ feet identify them as saints and at least some can be recognised. The lady at the back on the right hand side is most likely the Virgin Mary who was with the disciples for the Ascension. The figure at the front in red can be identified as Saint John by his clean-shaven and youthful appearance. To his left in the blue the bald head points to that gentleman being Saint Peter. The figures behind them are harder to identify but the somewhat messy hair and beard of the figure on the centre right could well be Saint Andrew. 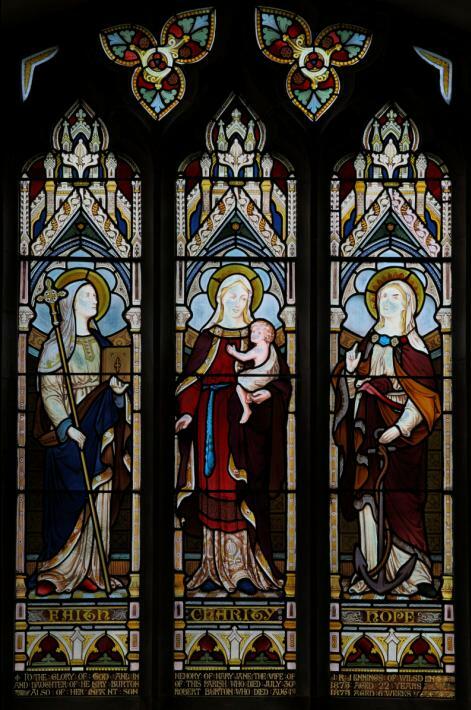 This window features the physical embodiment of the theological virtues highlighted in Paul’s first letter to the Corinthians in 1:13 "And now these three remain: faith, hope and charity. But the greatest of these is charity." This last sentence is the reason that Charity occupies the centre light rather than following the order given in the first line. There are early Roman writings about three martyred female saints bearing these names (Fides, Spes and Caritas in Latin). Whether or not there is historical truth in this history it led to the production of icons featuring them and in turn their depiction in works of art in various media. The left hand light shows Faith with her eyes lifted up to heaven and a calm expression on her face. She holds an empty cross and the Bible. From these symbols it can be inferred that to have faith is to accept the teachings of Jesus set out in the Bible and to accept the truth of his resurrection shown by the empty cross. To have faith is to trust in God and to accept His will. In the centre light stands Charity with an infant in her arms. The portrayal of this virtue as a woman nurturing children was first developed in 14th Century Italy and became a common image. Hope stands in the right hand light and is recognisable by the anchor she holds. This is seen as a Christian symbol of hope because early Christians used it as a disguised cross when they placed markers to guide the way to meeting places. Christians who saw the anchor knew that there others who shared their faith nearby. The anchor can also be seen as a symbol of Christ from a teaching in the Bible that he was "hope we have as an anchor of the soul, both sincere and steadfast" (Hebrews 6:19). ‘Faith, Charity and Hope’ as well as ‘The Ascension’ are the work of York glazier John Ward Knowles. After leaving school at the age of 12 he enrolled at the newly opened School of Design in York in 1851, winning several prizes for his stained glass work. In 1858 he moved to London for a year to work for Heaton and Butler, where he developed an interest in photography and architecture. He returned to York in 1863 and set up his own business. Marriage to Jane Annakin in 1874 produced two sons and four daughters. The sons, John Alder and Milward followed him into the family business of J W Knowles & Sons. Whilst his sons worked alongside him to produce stained glass the workshops produced all kinds of ecclesiastical decoration including embroideries and tapestries produced by his daughters. Knowles was based in York in Stonegate at the old ‘Sign of the Bible.’ Even after it ceased to function as a workshop for the business in 1953 the property remained the Knowles family home for one hundred and twenty years.